Football fans often say it is the hope they can’t stand, but at least Doncaster Rovers now have a bit. It was beginning to look like a complete lost cause. And it might be a case of too little too late when the final totting up is done but Rovers are at least showing signs of some green shoots of recovery. The pain of three and a half miserable months, 17 win-less games, and one of the club’s worst ever runs finally came to an end on Saturday in the shape of a coupon-busting, yet also fully deserved, win over League One leaders Wigan Athletic. The sheer sense of relief on and off the pitch was palpable when Andy Williams’ late penalty hit the back of the net and effectively sealed victory against a side who had not lost in their previous 20 matches. Rovers pick their moments, evidently. They still very much have the proverbial mountain to climb as they languish six points adrift of safety with just four games remaining. And should Doncaster end up playing fourth tier football next season for the first time in more than a decade, a late show of spirit will be scant consolation and nor will it paper over the cracks of an utterly diabolical campaign. But at least Rovers are still in with a fighting chance of pulling off what seemed like a very unlikely great escape prior to coming face to face with one of the country’s most in-form teams. At least they are fighting too. 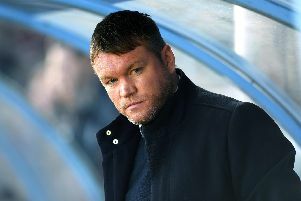 Darren Ferguson’s side might have collected just one point from their previous two games, at Rochdale and Bury, but they showed more desire in those 180 minutes than they did during an appalling seven straight defeats in March. And they took the momentum gained from those performances into their meeting with a Wigan side that had won their last five games on the spin and were seemingly strolling towards an instant return to the Championship. It begs the question why this renewed spirit took so long to emerge? And why was the hapless 17-game sequence not nipped in the bud much sooner? Perhaps Rovers are no longer playing with fear. Perhaps they feel like they no longer have anything to lose. Whatever the science behind it, Doncaster saved one of their best displays of this sorry season for the visit of arguably the league’s best team. Right from the off there was a drive and determination about Rovers, but also more care and craft in possession too. Ironically they probably played their best football in the first half, which ended with them trailing to Will Grigg’s 41st minute header. But in a more frenetic second half what they lacked in composure they more than made up for in terms of endeavour as they swarmed all over the Latics from the re-start, turned the game on its head thanks to an Andy Butler brace and withstood an expected onslaught from the visitors before Williams had the final say. Rovers’ first half supremacy was reflected in the fact that Wigan boss Gary Caldwell was forced into a substitution and tactical re-jig on 40 minutes when Michael Jacobs came on and the Latics switched from three at the back to four. Prior to then, the away side could have had no complaints had they gone behind. In the first minute Williams almost got on the end of a Gary McSheffrey free kick, and McSheffrey himself - who typified Rovers’ busy approach - went close with a powerful shot that whistled narrowly over. Nevertheless, Wigan went ahead against the run of play. The imposing Yanic Wildschut, who had gone close earlier in the half, led a three-on-three breakaway and was given far too much time and space to burst into the box and cross for Grigg, whose well-directed header crept inside the far post. At that point Rovers might have gone into their shells and thought ‘here we go again’. But to their credit they came out for the second half with the bit between their teeth. Craig Alcock saw his header from James Coppinger’s corner cleared off the line but from their next corner Butler steamed in at the back post and powered a header past Jussi Jaaskalainen. Three minutes later Butler stuck his left foot on the end of a McSheffrey corner from the other side to put his side ahead. And Williams then came within a whisker of making it three when he headed another corner inches wide. Rovers had to dig deep to withstand a period of pressure that saw Wildschut, Max Power and Jacobs all fire efforts narrowly wide. But withstand it they did, before David Perkins’ challenge on McSheffrey earned him a red card and Rovers a penalty, which Williams duly converted to the relief of teammates and supporters alike.